Silver Banshee is a fictional character, a supervillain appearing in comic books published by DC Comics, primarily as an opponent of Superman. However, she is a superheroine in DC Super Hero Girls, similar to the Batman villainesses. In television, she has been portrayed by Odessa Rae in Smallville and Italia Ricci in Supergirl. Silver Banshee's debut in Action Comics #595 (December 1987). Cover by Byrne. 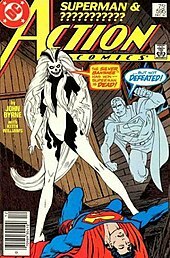 Silver Banshee first appeared in Action Comics #595 and was created by John Byrne. Siobhan McDougal was the first-born child of Garrett McDougal, the patriarch of an old Gaelic clan that has occupied an island midway between Scotland and Ireland for a thousand generations. On that island is Castle Broen, where first-born McDougals undergo a ritual to prove themselves worthy to lead the clan. When Siobhan was young, she traveled the world, only returning to Castle Broen when she heard of her father's death. Her uncle Seamus determined that no woman would lead the clan and intended her brother Bevan to become the new patriarch. She went ahead with the family ritual by herself, which involved calling on supernatural forces for power. She was interrupted by Bevan, and the distraction proved disastrous as she was dragged away into an infernal netherworld. An entity called "the Crone" granted her powers and the ability to return to Earth as the Silver Banshee, but demanded payment in the form of an occult book that belonged to her father. She found that her father's book collection had been shipped off for sale in the United States. Her quest brought her to Metropolis. Killing anyone that stood in the way of her search attracted the attention of Superman, who was able to defeat her when he realised that she could only kill a person once as she turned away from someone who resembled a previous victim; by faking his death, Superman was able to enlist the Martian Manhunter to attack Banshee by posing as Superman's ghost. Unable to defeat Superman, she chose to retreat and continue her mission at a later date. Silver Banshee returned to Metropolis twice more, but was halted both times by Superman. It was Batman who finally found the book among some stolen goods in Gotham City. Superman brought the book to Castle Broen where he was confronted by Silver Banshee. The Crone appeared at the castle, and after an enigmatic warning to Superman, she dragged the Banshee, Bevan, and Seamus off to her Netherworld. In Leesburg, Supergirl rescued Silver Banshee from Satanus' Netherworld when the chaos flow brought the river Styx to the town. Silver Banshee was left in a confused state, eventually going back to her psychotic persona and using Supergirl's friend Mattie as a host while rampaging on the streets. Mattie and Silver Banshee thus proceeded to nearby Schnaffenburg where Mattie tried to get revenge on Gerald McFee, who killed her brother during Final Night while in thrall to Gorilla Grodd. Supergirl calmed Silver Banshee, separating Mattie from her, which led to Silver Banshee temporarily vanishing. Silver Banshee was one of the final four villains- along with Bizarro, Mongul, and the Master Jailer- sent against Superman by Manchester Black, Black using his powers to make Banshee and Bizarro sane enough to tactically outthink Superman, also granting Banshee awareness of his Kryptonian name so that she could use her magic against him more effectively. Despite this, Superman was able to defeat the four, forcing Mongul to expend his energy before dropping a nuclear-powered superhuman onto the deserted island that they were currently inhabiting. Silver Banshee attempted to collect the billion dollar bounty Lex Luthor placed on Superman's head in Superman/Batman #3, but failed, with Batman using an ultrasonic generator to keep her nullified. Silver Banshee later joined the Secret Society headed by Alexander Luthor. She was one of the members who turned on Black Adam when Luthor needed him for his machine. She also took part in the Battle of Metropolis. Silver Banshee battles Supergirl in Supergirl #34, and is expected to be a recurring nemesis for Supergirl, as well as Superman, as part of an attempt to tie Supergirl's book in with Superman's titles. In Superman #682, Supergirl was used as a diversion as some members of Kandor captured Silver Banshee, placing her in the Phantom Zone. Later, Superman freed Silver Banshee to be taken to Belle Reve. Inspector Henderson with other police officers break into an apartment, but it explodes and then they find a corpse covered in runes. Kara meets with Inspector Henderson, who's following a case his old mentor was never able to close, and thinks it has to do with items Silver Banshee needs to lift her curse. Inspector Henderson finds his mentor had the item, but it imbeds itself in Inspector Henderson's hand, allowing Silver Banshee to track him. Silver Banshee shows up and fights Supergirl, but Supergirl opens a package from Henderson and becomes possessed by a Banshee hybrid. Banshee-Supergirl and the Silver Banshee battle each other as events are recapped. Supergirl tells Silver Banshee they hid the artifacts in people, in order to keep them hidden from her. Apparently all the items were hidden not as a curse, but as a test for prospective clan leaders. Henderson punches Banshee-Supergirl, which is effective because of the artifact in his hand. Supergirl tries to exorcise the spirits possessing her but fails. Henderson realizes the spirits are tied to the artifacts and can be used against them. He then stabs his hand and breaks Supergirl free from her spirits. Silver Banshee then uses her wails to disperse the spirits. She finally uses magic to remove the artifacts from Henderson's hand and lets him know she is indebted to him. In the 2011 reboot of DC's superhero continuity, The New 52, Siobhan Smythe first appears in Supergirl vol. 6 #7 as a girl from Dublin who had immigrated to the United States to start a new life after her mother died, and to escape her father (the also-dead Black Banshee). She befriends Supergirl, and stood up to the National Guard who tried to gun Supergirl down, as she could clearly see that Supergirl had saved the city from Kryptonian Worldkillers, but is the only one who can speak her language. She invites Kara to live with her, and brings her along to a cafe where she performs music when her dead father, the Black Banshee, attacks, prompting her to transform into the Silver Banshee. The two fight Black Banshee only for Supergirl to be absorbed into the villain's body. While inside she relives nightmarish versions of her own memories and encounters Tom Smythe, Siobhan's brother. He explains how the Banshee is a curse passed down along his family line and how Black Banshee had plans for his daughter to join him in conquering the world. Tom had sacrificed himself in Siobhan's place, hoping it would end the curse. Instead he only managed to delay it. Fighting Black Banshee together, they succeeded in escaping and defeated him for good. Siobhan reverted to normal and was reunited with her brother. Later Supergirl left them, feeling she was only putting them in danger by being around them. Siobhan later appears in the Red Daughter of Krypton storyline, when Supergirl gets taken over by a Red Lantern Ring after a battle with Lobo. Siobhan transforms into Silver Banshee again but struggles for control over her body. Due to Supergirl's vulnerability to magic, Siobhan manages to hold her own against her and uses her sonic abilities to teleport herself and a berserk Kara from New York to the Catskill Mountains in order to avoid casualties. Unable to defeat Kara, she manages to convince her to leave Earth before she ravages the entire planet. Both Silver Banshees possess possibly limitless superhuman strength, endurance, resistance to injury (although she is not invulnerable), as well as flight. Her deadliest superpower is her sonic death cry; able to kill anyone within hearing range, so long as she sees them and knows their birth name. Her sonic cry has the effect of reducing those who hear it into desiccated husks, effectively draining the life from them. This has led to the Silver Banshee often being described as a succubus; sucking the life out of her victims while she grows stronger with each soul she ends. As Siobhan Smythe of The New 52 continuity, the Silver Banshee has exhibited an affinity for "omnilingualism"; able to instinctively speak any language fluently from the first moment she hears it, including being able to commune with animals (such as talking to a flock of doves). In the 2003-04 limited series JLA/Avengers, Silver Banshee appears as a villain in Metropolis under Krona's control. She helps to take down Aquaman while he is searching the city with the Vision, but is ultimately defeated by Wonder Woman. In the 1998 miniseries JLA: The Nail, the Silver Banshee makes an appearance in Professor Hamilton's Cadmus Labs. Silver Banshee appeared in the Smallville episode "Escape", played by Odessa Rae. This version is a deceased Gaelic heroine who was cursed and placed in the underworld. Just like her recent appearances in the comics, this version needs to possess a host. Her abilities are her sonic scream and possesses superhuman strength, stamina and durability. When she utilizes her powers, her irises glow white. Italia Ricci as Siobhan Smythe/Silver Banshee in CBS/CW television series Supergirl. Italia Ricci appears as the Siobhan Smythe version of Silver Banshee in Supergirl starting in the episode "Truth, Justice and the American Way". Smythe is hired by Cat Grant as her new primary assistant to the displeasure of Kara, as Kara sees Siobhan as a threat. Siobhan starts to date Winn Schott, but is continually distracted by her passionate grudge against Kara. When in a drunken rage she falls from a high-rise rooftop, she cushions her fall with the emergence of her hypersonic abilities through her screams. After inspection by the Department of Extranormal Operations (DEO), she seeks answers from her aunt, who explains that the women in their family are cursed by a banshee spirit that can only be satisfied if they kill the object of their rage. 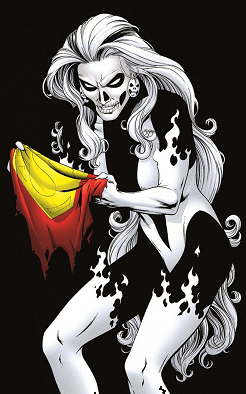 Though the DEO is oblivious of Silver Banshee's powers' supernatural origins and initially suspected to be an extraterrestrial, she, along with Livewire, are later referred by Supergirl as metahumans after the Flash's arrival; the heroic speedster revealed metahumans' existence to Supergirl, her allies, and the DEO. Embracing her identity as a supervillain, Silver Banshee teams up with Livewire in an attempt to kill Supergirl, Kara Danvers, and Cat Grant. However, the pair are defeated by Supergirl and the Flash. She and Livewire are then incarcerated in National City Prison's new specialized chambers provided by the Flash for containing metahuman criminals. Silver Banshee appears in the Justice League Unlimited. This version can fly and can drain her opponents of their life energy at will which will age them in seconds. She is seen as a member of Gorilla Grodd's Secret Society as seen in "I Am Legion." In "Chaos at the Earth's Core," Silver Banshee accompanied Metallo to Skartaris to retrieve a large chunk of Kryptonite that is in the custody of Warlord and his allies. She is captured by Green Lantern after he uses his power ring to gag her. She escaped soon after being captured. Kim Mai Guest is credited for voicing Silver Banshee even though she has no identifiable dialogue. Silver Banshee is shown with the Secret Society shown on "Alive". As she is seen fighting on Grodd's side during his mutiny against Lex Luthor, but is not shown among those frozen by Killer Frost or those who survived Darkseid's attack. It is likely she was killed by Star Sapphire during the mutiny, as said was seen knocking Banshee out with her energy beam and later hitting her again multiple times. A character based in Silver Banshee named Scream Queen appears in the Batman: The Brave and the Bold television series. Scream Queen partnered with Scarecrow in a Halloween scheme to spread fear gas across the town through the use of pumpkins. When Batman and Jay Garrick/the Flash came to foil their plot, Scream Queen was eventually defeated when a fear gas pumpkin was shoved into her face and the hallucinogenic effects made her see the Flash as a monster. Silver Banshee appears in the animated movie Superman/Batman: Public Enemies. This version can also fly. She is one of the many supervillains that wants to collect the $1 billion bounty that President Lex Luthor has placed on Superman. She is defeated when Superman takes her to the upper atmosphere where she cannot breathe. While she is unconscious, Batman places a device on her that nullifies her power by turning it against her will. Silver Banshee, along with Parasite, Brainiac, and Doomsday, were considered as the main villains in Superman Reborn, but the film was cancelled before it began production. The Siobhan McDougal version of Silver Banshee appears in Batman Unlimited: Monster Mayhem, voiced by Kari Wuhrer. She (along with Scarecrow, Solomon Grundy and Clayface) joined the Joker's gang of monsters to wreak mayhem on Gotham City. During Joker's parade, Silver Banshee sings quite beautifully. According to some concept art, Silver Banshee was originally planned to be featured in The Lego Batman Movie. The Siobhan Smythe version of Silver Banshee appears in Suicide Squad: Hell to Pay, voiced by Julie Nathanson. In the film, she is one of Professor Zoom's henchmen (along with Blockbuster); it is stated by Zoom that she is allied to him so that he could help her get back in time to get revenge on her former clan for banishing her. She also has history with the Steel Maxum version of Doctor Fate, whom she previously crossed paths with before. Silver Banshee and Blockbuster are later killed by Killer Frost, who freezes their bodies from the inside. Silver Banshee appears in DC Super Hero Girls, first appeared in a cameo in Season 4, Episode 11 "Ha-Ha Horticulture". She wants to be heard, and her powers of sonic manipulation make it easy. She's also a formidable member of the Debate Team and an epic vocalist with a taste for loud rock in Band Club! Silver Banshee appears as a playable character in DC Unchained. Silver Banshee appears as a playable character in DC Legends. There is a gear piece entitled "Siobhan's Boots" for Supergirl in Injustice 2. Silver Banshee is a playable Arcane character in the mobile version of the game, with a moveset based on Black Canary. The Siobhan McDougal incarnation of Silver Banshee appears as a playable character in Lego DC Super-Villains, with Julie Nathanson reprising her role from Suicide Squad: Hell to Pay. ^ Davis, Alan (w); Davis, Alan (p), Farmer, Mark (i). JLA: The Nail #3. DC Comics. ^ Natalie Abrams. "Smallville Casting Exclusive: Odessa Rae Joins as DC Villain". ^ Stanhope, Kate (December 4, 2015). "'Supergirl' Taps 'Chasing Life's' Italia Ricci to Recur as DC Comics Villain". The Hollywood Reporter. Retrieved December 4, 2015. ^ "Truth, Justice and the American Way". Supergirl. Season 1. Episode 14. February 14, 2016. CBS. ^ "Worlds Finest". Supergirl. Season 1. Episode 18. March 28, 2016. CBS. ^ "EXCLUSIVE TRAILER DEBUT: Joker Rules in "Batman Unlimited: Monster Mayhem"". Comic Book Resources. ^ "The LEGO Batman Movie Set/CMF Rumors & Discussion". Eurobricks Forums. ^ Brittany, Michele (March 30, 2018). "WONDERCON 2018: JULIE NATHANSON TALKS SILVER BANSHEE IN 'SUICIDE SQUAD: HELL TO PAY'". Fanbase Press. Retrieved March 30, 2018. Silver Banshee at DC Universe.